Sitting in church this morning, I suddenly got a MAJOR craving for bacon-wrapped shrimp. Inner dialog - "Bacon-wrapped shrimp. Oh, yeah. Bacon-wrapped shrimp. I really need some of that! - Hey! Listen to Pastor's sermon! He's saying some great stuff! - Oh, MAN I want some bacon-wrapped shrimp!! - LISTEN!! Pay attention! - Mmmm..... crispy bacon wrapped around a large piece of shrimp, maybe with a jalapeno and some cheese inside, too - Hey! Get your mind on the service!!" - and so on and so forth. In between listening to the sermon, my brain ran around in circles trying to remember which restaurants nearby served these tasty morsels. It landed on Fresco's Cocina Mexicana. One of my favorite restaurants. My husband and older daughter had tickets to a Texas Rangers ballgame that afternoon, so my younger daughter and I headed out to Fresco's when church was over. 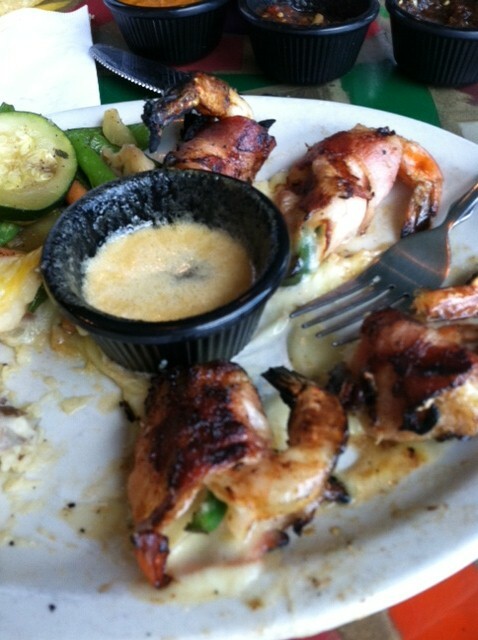 Large shrimp, jalapeno, cheese, wrapped in bacon and grilled. Every bit as good as my taste buds had been telling me they were going to be. A side of garlic mashed potatoes and grilled vegetables to go along with them. That's what I call lunch.